Finally, a better way to prevent hoof pain and soreness. Rebound Hoof Pack® is a potent, super sticky hoof packing, formulated to draw pain, soreness and inflammation out of the hoof. 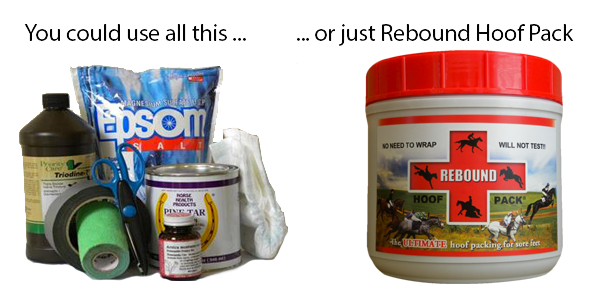 Stop spending time and money on duck tape, diapers and individual ingredients - our unique formula adheres directly to the hoof, so you'll never have to wrap again! Rebound Hoof Pack will get the sting out after a hard gallop, pulled shoes or a long day's work. It's so easy there's no excuse not to pack your horses hooves! 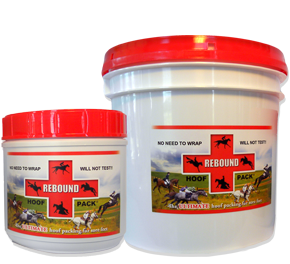 Rebound Hoof Pack is available in a 3.5 lb (1.6 kg) jar or an 11 lb (5 kg) bucket and is available online or at stores in the United States, Canada and elsewhere. No need to buy individual items - our easy-to-use formula adheres directly to the hoof, so you'll never have to wrap again! Rebound is formulated with a special blend of hand-picked ingredients that have never tested and will not irritate your horses skin. 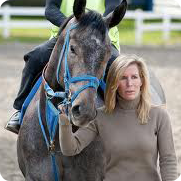 Founder Ashley Kehoe created Rebound as a better way to pack following a hard day of galloping and jumping at competitions.